Most office buildings are cloistered away from nature, let alone agriculture. One exception is the Toronto’s www.124merton.com a boutique office building, whose bounteous crops reap benefits for the tenants both local and international. 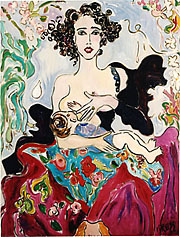 Owner, artist, designer and chef, Vivian Reiss has been in avant garde of urban farming, having practiced it for over 38 years. She conceived the gardens of the boutique office building in midtown Toronto to function an inspirational oasis for work as well as for culinary creations. 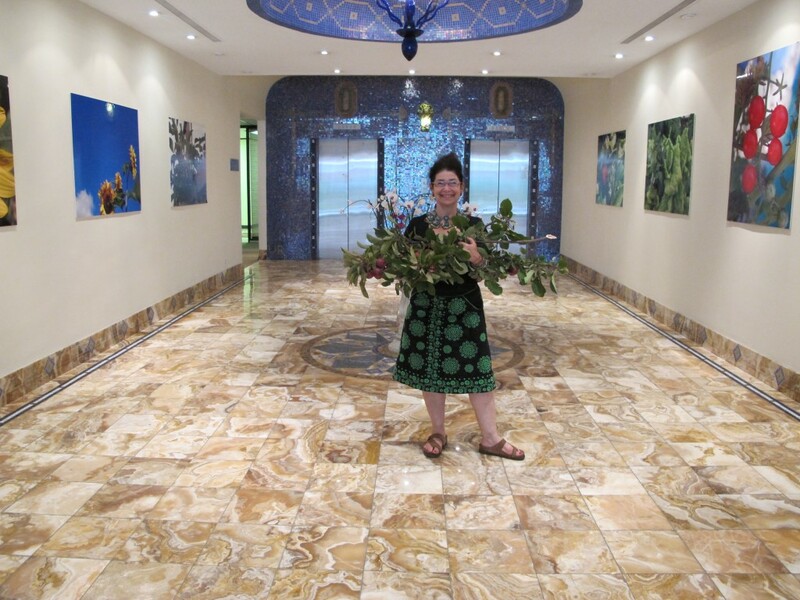 She has developed over 400 recipes using the crops grown in the building’s three separate garden spaces. All of the gardens are open to the building’s tenants, whose offices range from 900 square feet to 3,000 square feet. As soon as you approach the woodland themed front entrance, landscaped with rocks from the Canadian Shield, you know you are in a special place. Amid giant pines peeks a surprise. The midtown Toronto location affords a microclimate, that allow Mediterranean artichokes to not only to grow but have a flourishing crop of edible artichokes. 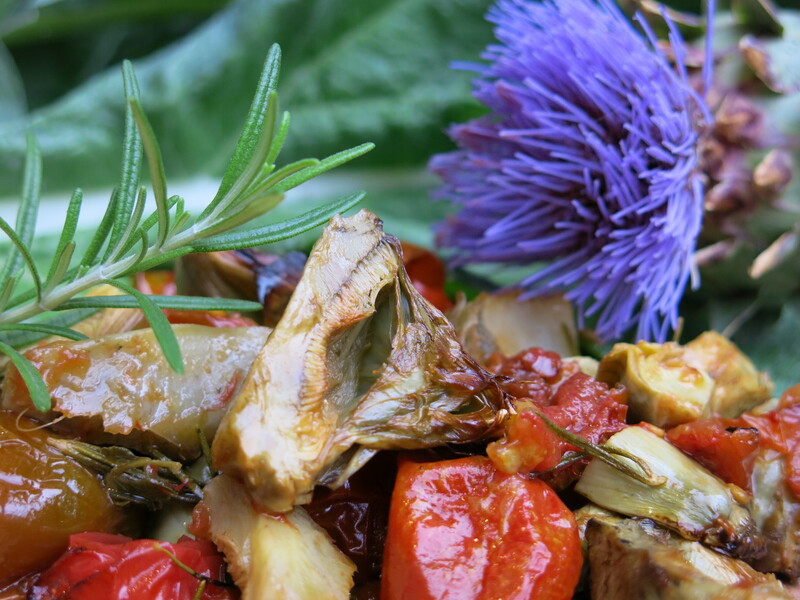 Imagine slow roasted fresh picked artichokes, nestled among super sweet ” Paul Robeson” tomatoes and fragrant rosemary just harvested from it’s rooftop urban farm, and you have an idea of range of the pleasures that this office building can yield. The second floor courtyard goes more Canadian Prairie, with Saskatoon berry trees named after one of that province’s largest city and named for the trees that provide crops of the almond tasting berries both in the eponymous city and midtown Toronto. The Saskatoon trees are planted in huge custom containers that divide the courtyard into various areas both for lunch and meetings. Eclectic garden furniture, from designers like Woodward to the “Memphis” group, as well as a barbeque, lend whimsy as well as practicality to the space. It is on the 6th floor rooftop farm that 124 Merton Street goes truly international. 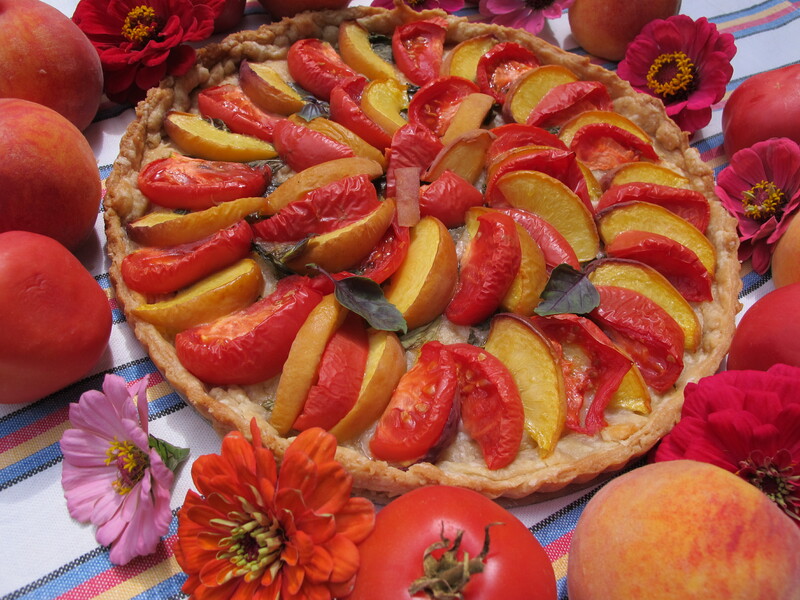 Among the Canadian” Maypole” apple trees, Prairie “Romeo” and “Juliette” cherries, Haskap berries and giant sunflowers, are 124 Merton’s premiere crop, the over 40 varieties of heritage tomatoes from around the world. The choice of varieties of tomatoes are vast, so keeping some favorites that win in the buildings annual tomato tasting, judged by professional food critics and tenants alike, it is possible to grow and experiment with new types of tomatoes each year. The rooftop’s constant sunshine yields colorful crops and its 6th floor location protects the crops from wildlife, paradoxically a problem in urban edible gardens. 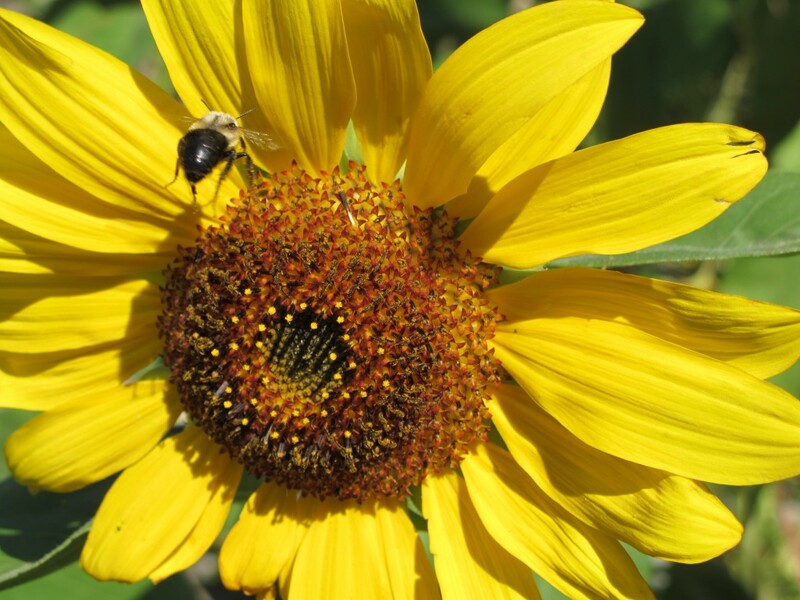 Happily though, bees find their way their to pollinate and animate the garden. 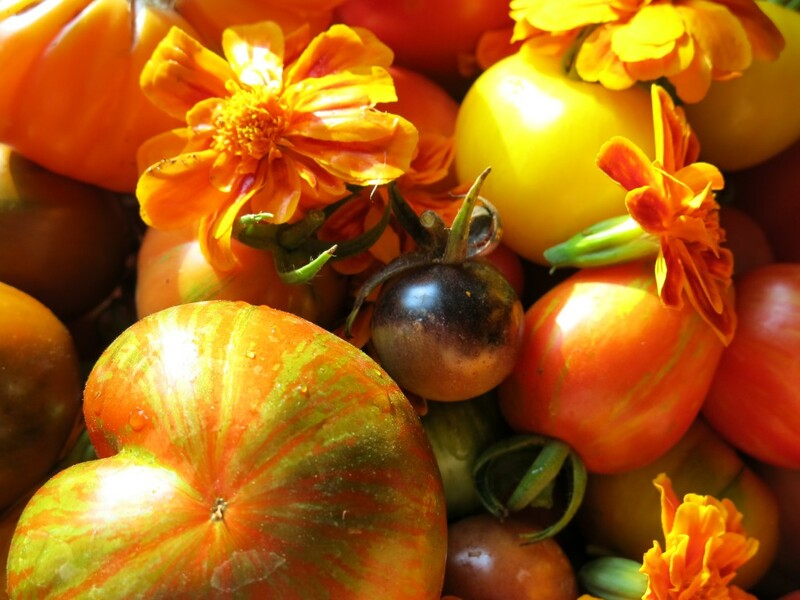 One of Reiss’ favorite tomatoes from the 2013 crop is the “Sweet Israeli”, a tomato whose honey like flavor and coloration that evokes dawn inspired a salad. 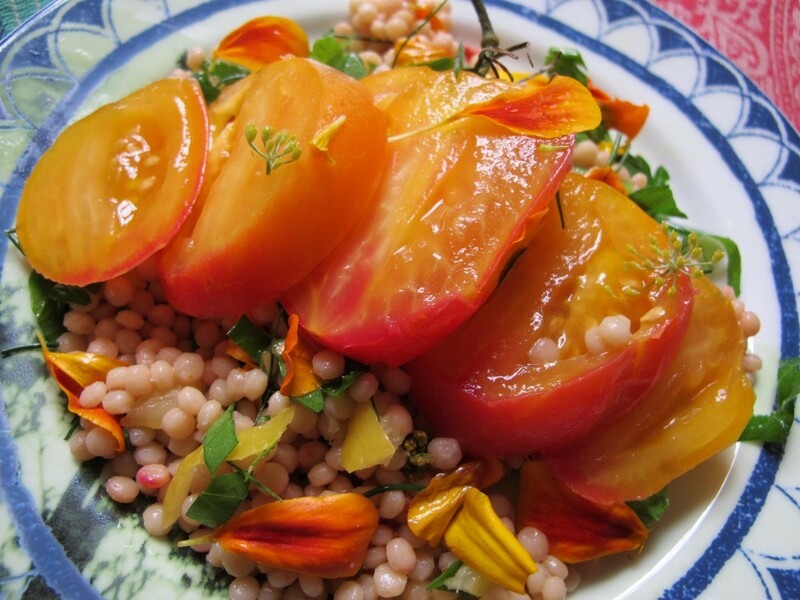 In the salad above, Israeli couscous is cooked in water in which copious amounts of marigold petals have been boiled and strained, providing color as well as flavor. The couscous, served at room temperature, is mixed with chopped preserved lemon, basil, fennel fronds and flowers, and more (this time uncooked) marigold petals, and tossed with olive oil and some preserved lemon juice. 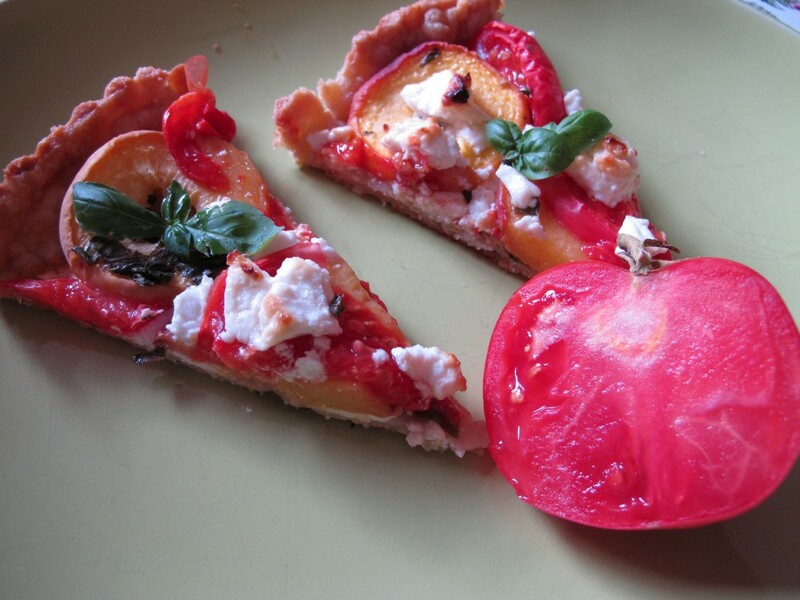 It is then topped with a sliced “Sweet Israeli” tomato and strewn with more flowers. Sometimes, one wants to eat something truly simple like Reiss’ “ Sunny Side Up”. To make this recipe one needs a slate roof tile. While the barbeque is heating slice as many varieties of tomatoes as you have available. Place them in a decorative array on the slate. Drizzle the tomatoes with olive oil and sprinkle with salt as desired. Bake in a closed barbeque until the tomatoes are hot and begin to cook .Take slate off the barbeque and crack two eggs onto the tomatoes. Return to barbeque, close the top and cook until the whites of the eggs are set. Serve the dish on the slate with a grinding of black pepper and coarse sea salt. 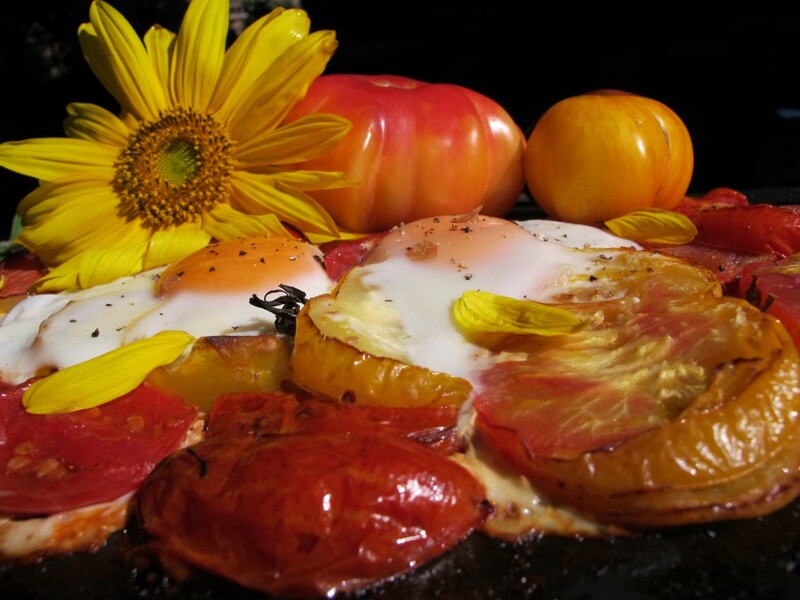 Casually strew some sunflower petals on the eggs and tomatoes. You will need as many slates as people, but probably you will probably want to eat this just by yourself, enjoying the tastes of summer without conversational distraction. 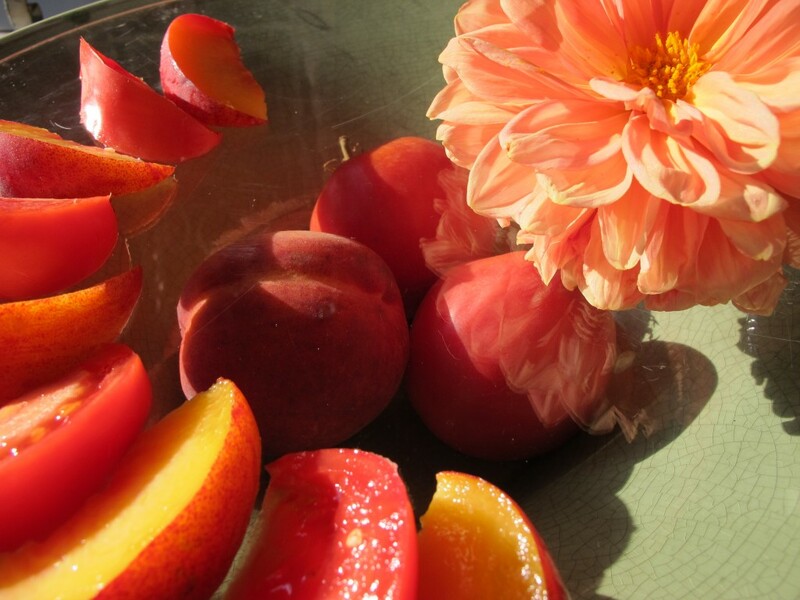 Summer’s simple pleasures and happiness on a slate. This entry was posted in art, decor, food, gardens, recipes, thought, travel, urban farming. Bookmark the permalink.